Inspect the speedometer by setting it in the input/output check mode DTC 12. 1. Adjust the tire air pressure to the specification. 2. 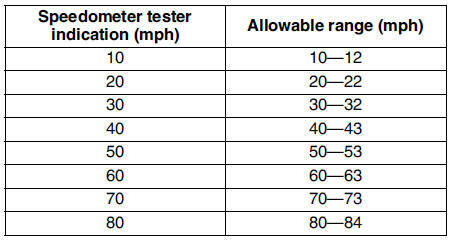 Using a speedometer tester, verify that the speedometer indication is within the allowable ranges shown below. 3. Verify that fluctuation of the speedometer needle is within the allowable range. If the speedometer needle does not move or the indication is outside of the allowable range, inspect the ABS (ABS/TCS) HU/CM (vehicles with ABS (ABS/TCS), DSC HU/CM (vehicles with DSC), PCM (vehicles without ABS) and related wiring harness. - If the ABS (ABS/TCS) HU/CM (vehicles with ABS (ABS/TCS), DSC HU/CM (vehicles with DSC), PCM (vehicles without ABS) and related wiring harness are normal, replace the instrument cluster. Inspect the tachometer by setting it in the input/output check mode DTC 13. If the engine speed exceeds the allowable range, the engine could be damaged. Therefore, when inspecting the tachometer, do not allow the engine speed to exceed the allowable range indication Bon the tachometer. (WDS or equivalent) to the vehicle DLC-2 16-pin connector. Inspect the fuel gauge by setting it in the input/output check mode DTC 23. Inspect the water temperature gauge by setting it in the input/output check mode DTC 25.